The euro rose against the dollar. The Germany foreign trade surplus rose up to 20.6 billion euro in October that exceeded traders’ expectations, relying on the 19.0 billion euro and surpassed the previous month results, fixing 18.6 billion euro. The US dollar profit-taking happened yesterday amid its overvalued. As a result, the euro with the US dollar rose to the level of 1.2447. 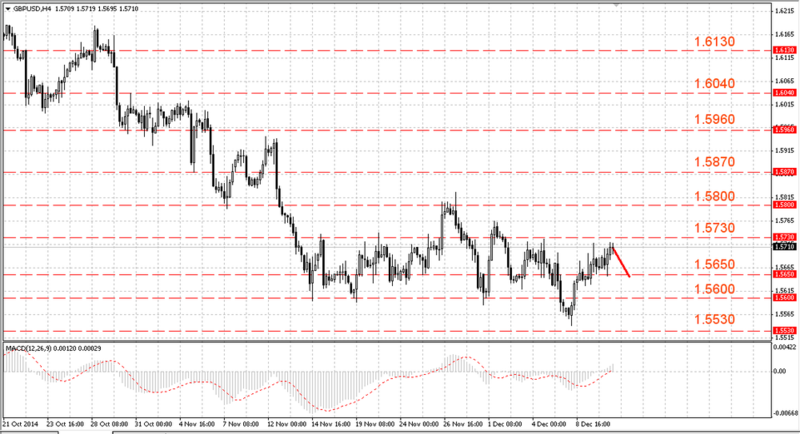 Their growth attracted interest for sale, the pair returned to the support near 1.2330-1.2350. 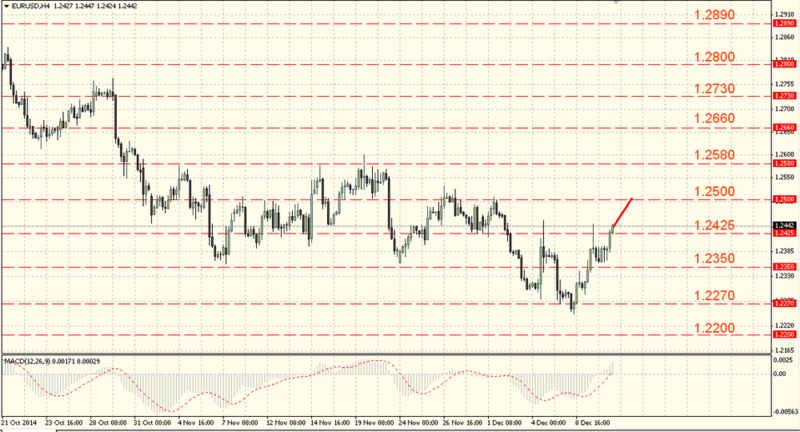 Then the pair grew above the resistance level of 1.2425-1.2445. The resistance breakthrough will allow bulls to test the resistance near the 25th figure and its completion will increase the possibility of temporary “bottom” reaching and a larger correction. 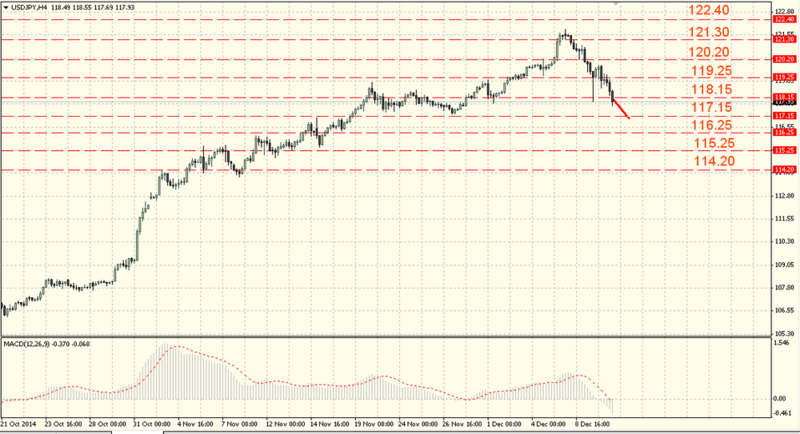 While the pair is trading below 1.2425-1.2445, the risks of the pair fall are preserved. Should the pair break the resistance we should expect growth to 1.5800-1.5820 and its completion will open the way to 1.5870-1.5890. While the pound is trading below 1.5730-1.5750, the risks of renewed decline are preserved. The Japanese yen has grown against the dollar as investors’ risk appetite continues to weaken – Nikkei fell by 2.25%. The news showed the inflation slowdown in Japan, one of the indicators – the purchasing prices index on the Japanese corporations goods fell down to 2.7% y/y from 2.9% y/y in November that was in the range of forecasts. Bulls could not return and consolidate above 120.00-120.20, as we warned, it has led to the pair decline as a result of which it has tested the level of 117.95-118.15. Here the dollar was sold off and it recovered to the mark of 119.05-119.25 that successfully holds back the bulls’ attack. Then the pair fell below the level of 117.95-118.15. While the pair is trading below 120.00-120.20, the chances of renewal decline are preserved, the growth and the pair ability to consolidate above will testify about the dollar return into uptrend.